This is a librarian thing rather than a writer thing, but it’s book-related, so I’ll post it anyway! 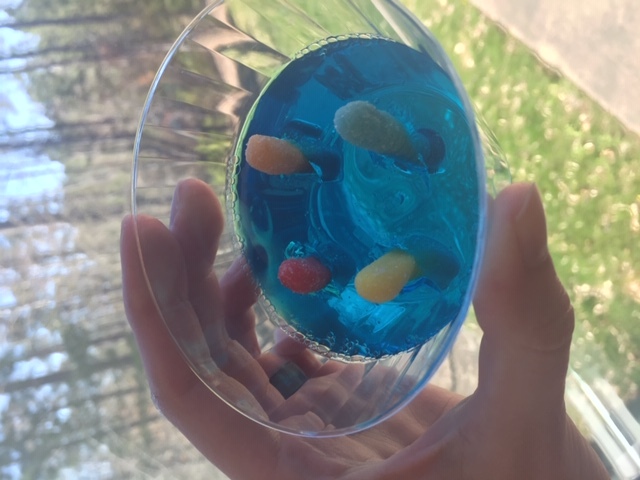 In preparation for the party, my coworker and I had fun making weird snacks! 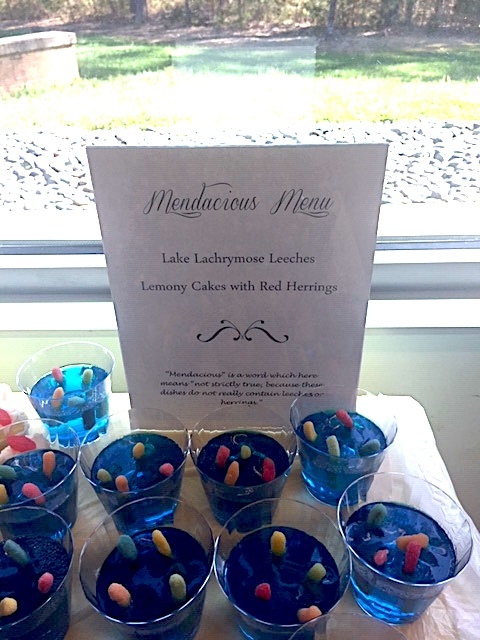 The Lake Lachrymose Leeches are sour gummy worms in Berry Blue Jell-O. (Fun fact: we had to buy real Jell-O because, while there are knockoffs that are slightly cheaper, we could not find them in any blue flavors. We wanted our lake water to be blue!) Once the Jell-O set, we just stabbed it with a sharp knife and inserted the gummy worms into the holes. 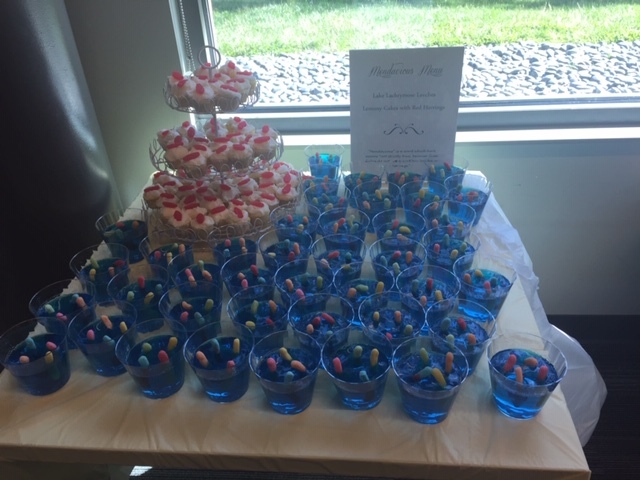 The Lemony Cakes are lemon mini cupcakes with lemon buttercream frosting, and the Red Herrings are, naturally, Swedish Fish. These decorations were lots of fun to put together. 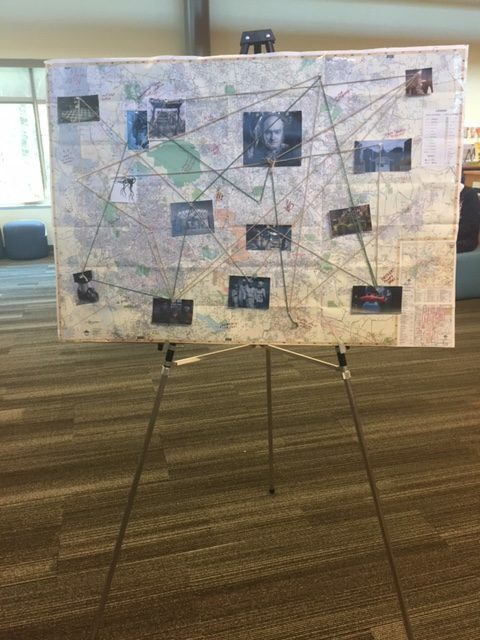 The map is an old one of Raleigh, NC! Our main, big craft was the felt Incredibly Deadly Vipers. 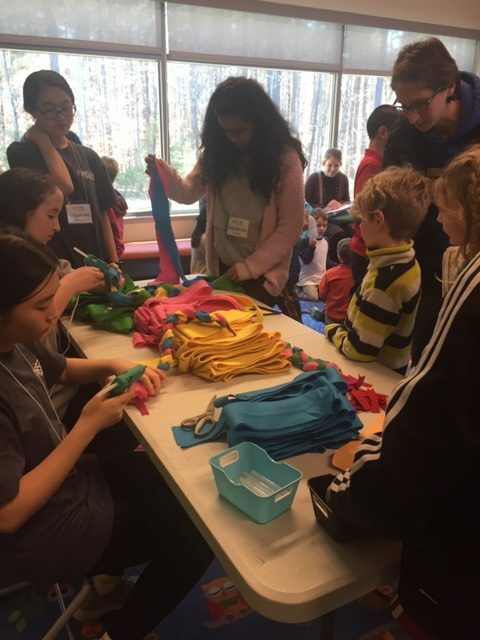 Our volunteers had previously prepared three-foot-long strips of felt, tapered at one end, and little felt snake tongues. We followed the instructions in this video to have each kid (with assistance, if necessary) braid a snake. Both ends were secured with large amounts of hot glue. 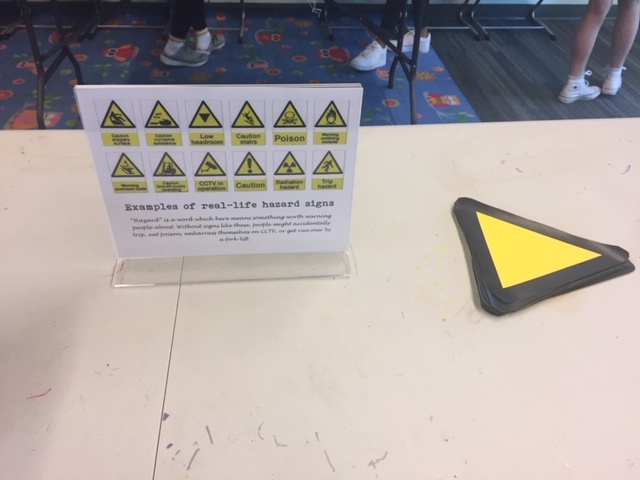 Our secondary craft was making Unlikely Hazard Signs. Kids could make signs warning of unusual hazards from the books – giant pincher machine, anyone? – or make up their own. “Hazard” is a word which here means something worth warning people about. Without signs like these, people might accidentally trip, eat poison, embarrass themselves on CCTV, or get run over by a fork-lift. We had a Secret Code Scavenger Hunt, though we didn’t really get photos of that. 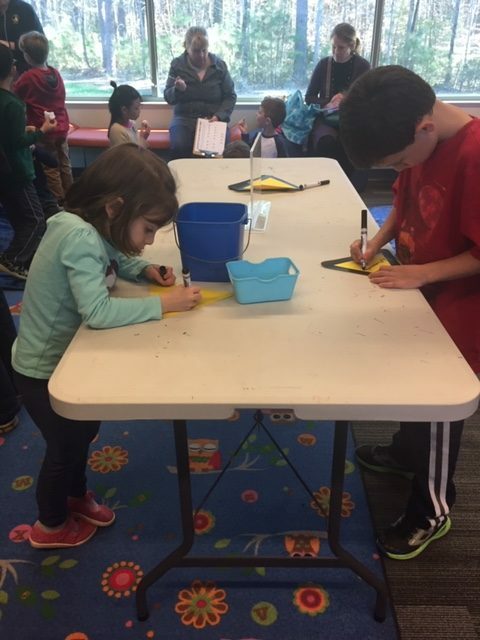 Each kid got a sheet with a series of symbols, and they had to search the library for little cards on which the symbols were translated into letters. Worked well . . . except that we’re pretty sure some little kid walked away with one of the cards, as no one, including us, could find it. 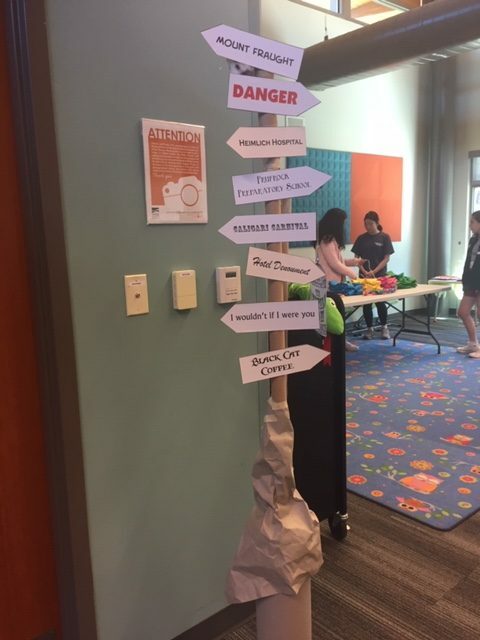 Such are the hazards of holding scavenger hunts in public libraries during open hours. 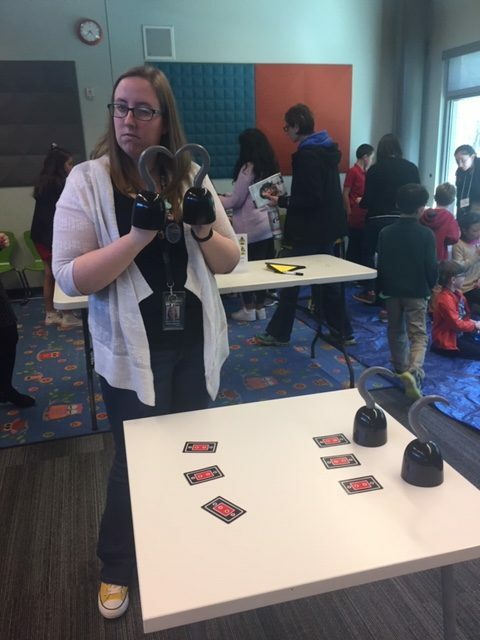 We also had Hook-Handed Double-Dealing, a game in which kids put on two hooks over their hands and then tried to flip over playing cards as fast as possible. They could either compete against each other, or against our awesome coworker who was running that station. They also had the option of playing alone while our coworker timed them, and then trying to beat their own best times. They loved that! This was all great fun. 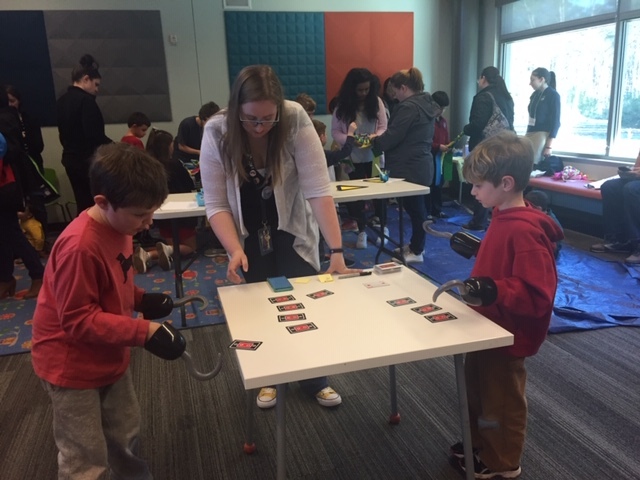 I want to share the photos and description partly because, when I was planning this program, I really appreciated other people’s posts on Series of Unfortunate Events parties they had put on. So here’s me trying to pay it forward. I hope this might help someone put on their own party!